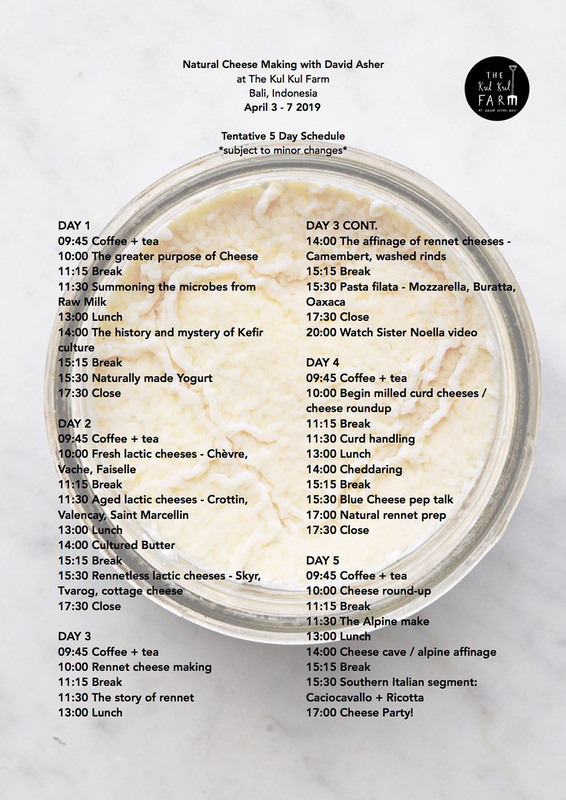 Join master cheese maker, farmer, author and educator, David Asher at The Kul Kul Farm this coming April for 5 days of learning the art of natural cheese making, using traditional, non-industrial methods to make cheese. On the first day you will learn how to care for the cultures of our cheese. We begin with a session on dairy fermentation, covering Clabber, Kefir, Crème Fraiche and yogurt. On the second day we will use our cultures and rennet to make fresh lactic cheeses such as Cream Cheese and Chevre, and Geotrichum-candidum ripened lactic cheeses such as Crottin, Valençay and Saint Marcellin. Also included are acid-coagulated cheeses like Skyr and Quark. On the third day we will look at rennet cheeses, preparing, in the morning, the basic curd that can become many different styles of cheese. By the afternoon, the curd’s acidity will have developed and we’ll be able to stretch the cheese into Mozzarella, Queso Oaxaca and other Pasta Filata cheeses. We will also explore the different rind ecologies of rennet cheeses including the white fungus of Camembert and the orange rinds of Limburger. On the fourth day we will make a Stilton, and explore the cultivation of blue fungus that gives this cheese its veins. With a slight variation in the make we will also prepare Cheddar. And on the fifth day we will make an Alpine cheese, and see how one cheese can evolve in many different directions including Tomme, Comte and Caciocavallo. With its leftover whey we prepare a batch of traditional Ricotta. Read the detailed schedule here. 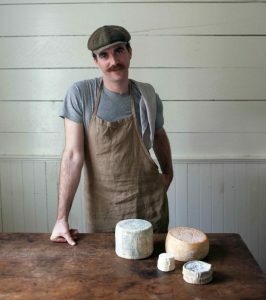 David Asher is an organic farmer, farmstead cheese maker and cheese educator based on the Gulf Islands of British Columbia, Canada. 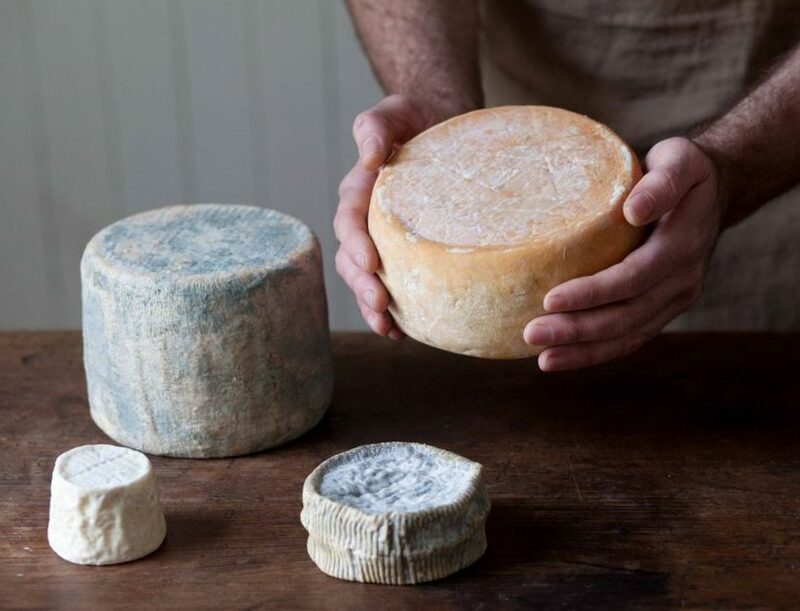 A guerrilla cheesemaker, David does not make cheese according to standard industrial philosophies – he explores traditionally cultured and organic methods of cheesemaking. David offers cheese outreach to communities near and far with the Black Sheep School of Cheesemaking. Through workshops in partnership with food-sovereignty-minded organizations, he shares his distinct cheesemaking style. His courses teach a cheesemaking method that is natural, DIY, and well suited to the home kitchen or artisanal production. He is the author of The Art of Natural Cheesemaking. We are located in the little village of Sibang Kaja in Bali, just a 2 minute skip away from the renowned Green School, 40 minutes from the capital city Denpasar, and 30 minutes from Ubud. Our farm is filled with food gardens, rainforest trees and animals. Your ticket does not includes accommodation on the farm. However you can chose an accommodation option for an extra US $150 (including breakfast and dinner) upon booking. We have 8 bamboo yurts amidst our sugar palm grove. The yurts are shared and include fans, mattresses, fresh linens, lockers, composting toilets and warm showers. Meals will be prepared fresh for you each day. Vegetarian options will be available at every meal. We are welcoming a maximum of 20 participants for this course. Please place your booking as soon as possible. We understand that sometimes things happen, and if you need to cancel your ticket we will give you a refund, less a US$ 80 admin fee, 2 weeks prior to the start date of the course. Within two weeks of the course no refund will be available, we will instead give you a credit note, less an admin fee of US$ 80, that you can use to participate in a future 2019 course.